Jerusalem is seen by both Palestinians and Israel as their capital. 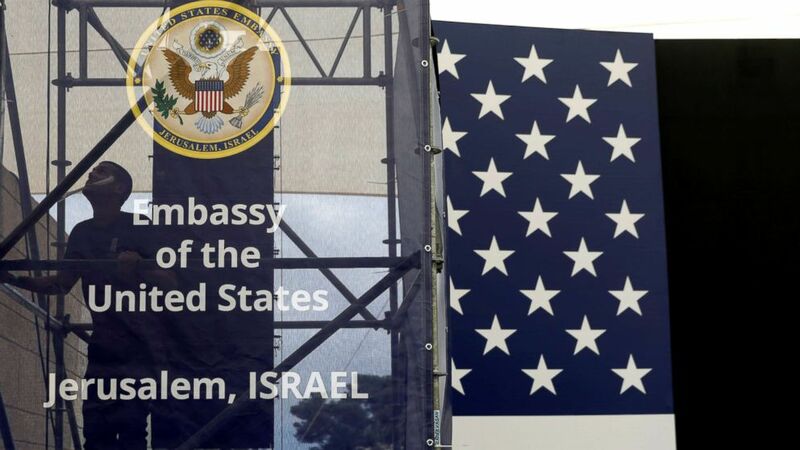 The U.S. today officially opened its new embassy in Jerusalem amid massive protests by Palestinians. The move comes five months after President Donald Trump made his blockbuster announcement in December that the U.S. embassy would shift from Tel Aviv to Jerusalem. The new diplomatic office, in what was an existing U.S. consular building, was opened in a ceremony led by U.S. Ambassador to Israel David Friedman and attended by Israeli and American officials. The day has also been marked by violence, with dozens of Palestinians killed by Israeli military forces and more than 1,600 injured in protests at the Gaza border against the embassy move, according to the Gaza Ministry of Health. "Today's historic event is attributed to the vision, the courage, and the moral clarity of one person to whom we owe an enormous and eternal debt of gratitude -- President Donald J. Trump," Friedman said to a standing ovation at the ceremony. (Menahem Kahana/AFP/Getty Images) From left, Treasury Secretary Steve Mnuchin claps as White House senior advisor and President Trump's daughter Ivanka Trump unveils an inauguration plaque during the opening of the U.S. embassy in Jerusalem, May 14, 2018. Trump addressed the gathering by video, celebrating the historic move and saying the U.S. "extend[s] a hand in friendship to Israel, the Palestinians, and all of their neighbors" and remains "fully committed to facilitating a lasting peace agreement" between them. The U.S. delegation was led by Deputy Secretary of State John Sullivan and included daughter and adviser Ivanka Trump and son-in-law and adviser Jared Kushner. About 800 people were expected at the event, including a congressional delegation with Republican Senators Lindsey Graham, Ted Cruz, Dean Heller, and Mike Lee. Kushner praised Trump in his speech. "While presidents before him have backed down from their pledge to move the American embassy once they were in office, this president delivered -- because when President Trump makes a promise, he keeps it," Kushner said. He also alluded to the Palestinian demonstration about 50 miles away. "As we have seen from the protests of the last month and even today, those provoking violence are part of the problem and not part of the solution," Kushner said. Kushner also drew a standing ovation with his reference to Trump's withdrawing the U.S. from the Iran nuclear deal. "Last week, President Trump acknowledged another truth and kept another promise. He announced his intention to exit the dangerous, flawed, and one-sided Iran deal," Kushner said. Among other prominent people present were Fox News personality Judge Jeanine Pirro, legal scholar and cable TV analyst Alan Dershowitz, and Republican megadonor Sheldon Adelson, who was seated next to Treasury Secretary Steven Mnuchin, who unveiled the seal of the United States on the side of the new embassy. 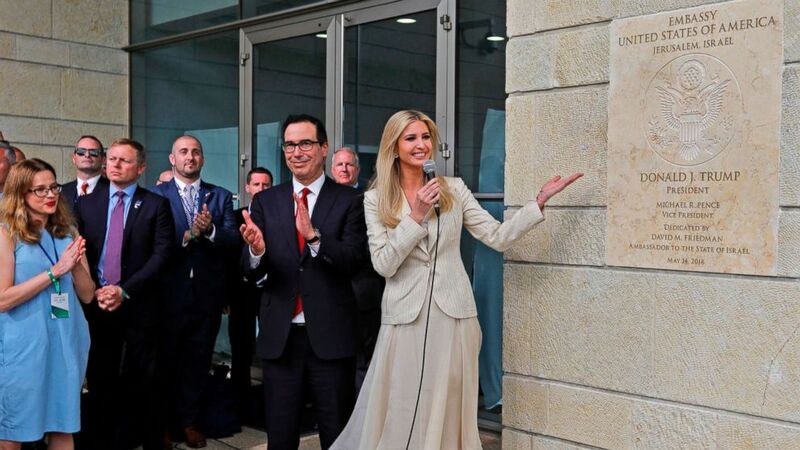 "On behalf of the 45th president of the United States, we welcome you officially and for the first time to the embassy of the United States, here in Jerusalem, the capital of Israel," Ivanka Trump said after the seal was revealed. 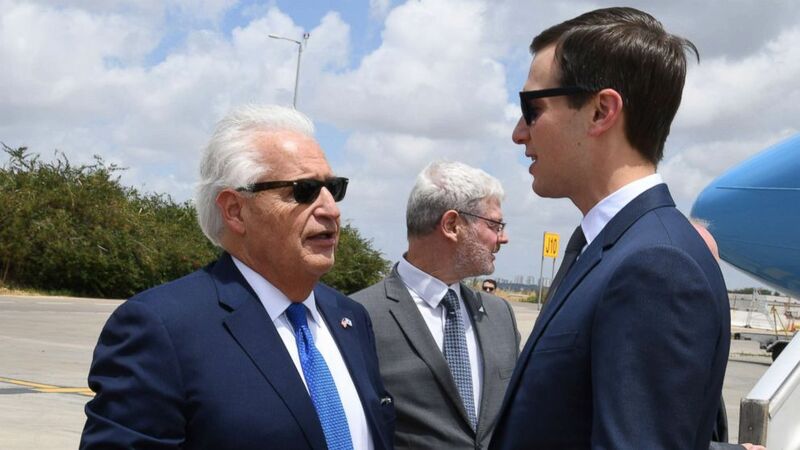 (U.S. Embassy Tel Aviv/Handout/EPA/REX via Shutterstock) A handout photo made available by the US embassy in Tel Aviv shows US Ambassador to Israel David Friedman, left welcoming Jared Kushner upon arrival near Lod, Israel, May 13, 2018. Israeli Prime Minister Benjamin Netanyahu thanked Ivanka Trump and Kushner for their involvement on the issue and extolled President Trump, saying, "By recognizing history, you have made history." "May the opening of this embassy in this city spread the truth far and wide, and may the truth advance a lasting peace between Israel and all our neighbors. 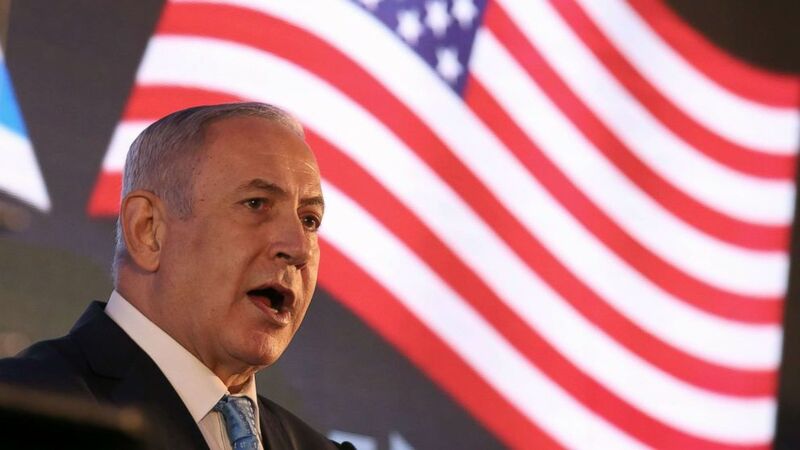 God bless the United States of America and God bless Jerusalem, the eternal, undivided capital of Israel," the prime minister said to another ovation. Trump himself, however, has said the U.S. hadn't changed its support for the status quo at Jerusalem's holy sites, and U.S. officials have continuously said the embassy move does not mean the U.S. has decided the final status of city's boundaries. The ceremony also featured a controversial American preacher, Robert Jeffress, who delivered a blessing at the invitation of Amb. Friedman. Jeffress -- who has made disparaging remarks about Mormons, Muslims, the Catholic Church, gays, and former President Barack Obama -- opened the event with a prayer, thanking God "every day that you have given us a president who boldly stands on the right side of history, but more importantly stands on the right side of you, Oh God, when it comes to Israel." His role in the event was condemned by many, including Mitt Romney, who tweeted, "Such a religious bigot should not be giving the prayer that opens the United States embassy in Jerusalem." The event was closed by a prayer from another pastor, John Hagee, who founded Christians United for Israel and also praised Trump's "courage" in moving the embassy. "Let the word go forth from Jerusalem today that Israel lives. Shout it from the house tops, that Israel lives. Let every Islamic terrorist hear this message, Israel lives. Let it be heard in the halls of the United Nations, Israel lives. Let it echo down the marble halls in the presidential palace in Iran, Israel lives," Hagee said to cheers. The American delegation touched down Sunday afternoon, and following a reception with the Israeli Foreign Ministry, dined at the prime minister's house. Earlier in the evening, in front of a very friendly and very enthusiastic crowd, Prime Minister Benjamin Netanyahu heaped praise on President Trump. "Thank you, President Trump, for your bold decision," Netanyahu said. "Thank you for making the alliance between Israel and the United States stronger than ever. 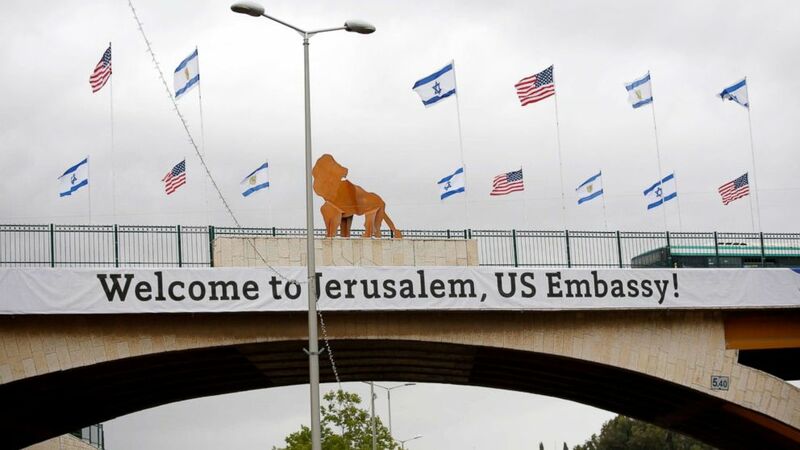 (Abir Sultan/EPA/REX via Shutterstock) A sign and flags appear on a bridge nearby the US consulate that will act as the new US embassy in the Jewish neighborhood of Arnona, May 13, 2018. "Now, you know how you recognize real leadership? It’s when others follow, and others are following in President Trump’s footsteps," he said, telling the crowd that Guatemala and Paraguay would both move their embassies later this week. He hinted at others, quipping: "That’s a state secret, and we don’t reveal our state secrets. Sometimes we reveal other’s state secrets. We’ll let you know as time comes." (Gali Tibbon/AFP/Getty Images) Israeli Prime Minister Benjamin Netanyahu attends the official reception of the opening of the US Embassy at the Ministry of Foreign Affairs in Jerusalem, May 13, 2018. The actual building is currently used for American consular services, including passport renewals, and visa and immigration services. It’s located in the Jewish residential neighborhood of Arnona -- in part in no man’s land between East and West Jerusalem -- but it’s not a fortress, like the U.S. Embassy in Tel Aviv. It's also not a beautiful old Ottoman-era building like the current U.S. Consulate in Jerusalem, which is located closer to the Old City. Friedman, who has been a loud supporter of this move from day one, has also been clear that he considers the embassy in "Jerusalem, Israel," making no distinction between Palestinian-majority east and Israeli-majority west. Palestinians see East Jerusalem as the capital of their future state. But for many Palestinians, failing to make the distinction all but ignores the existence of Palestinians. 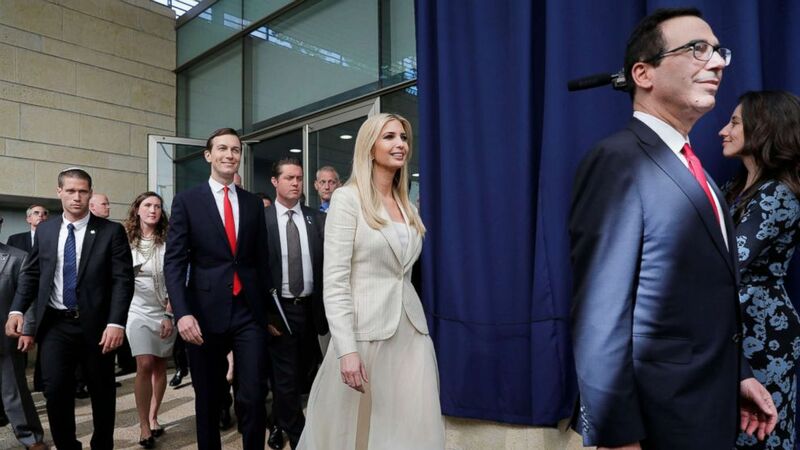 (Abir Sultan/EPA via Shutterstock) White House senior advisers Jared Kushner, Ivanka Trump, and Treasury Secretary Steven Mnuchin arrive for the opening ceremony at the U.S. consulate that will act as the new embassy in Jerusalem, Israel, May 14, 2018. "It takes away the hopes in having Jerusalem or parts of Jerusalem as the future capital of Palestine if a deal is to be struck between Palestinians and Israelis," Jerusalem resident, Ahmad Muna, 28, said Sunday. He added: "When Trump announced the move, he didn't mention Palestinians and didn't mention east or west Jerusalem. ... They've given all the claim, all the rights, of all the parts to the Israelis," Muna said, adding that he no longer believes the U.S. is interested in peace. (Ronen Zvulun/Reuters) A worker is seen inside the new U.S. embassy compound during preparations for its opening ceremony, in Jerusalem, May 13, 2018. U.S. officials insist they are, but no American member of the delegation will meet with Palestinians on this trip. When Trump announced the move, he said his decision marked "the beginning of a new approach to conflict between Israel and the Palestinians." 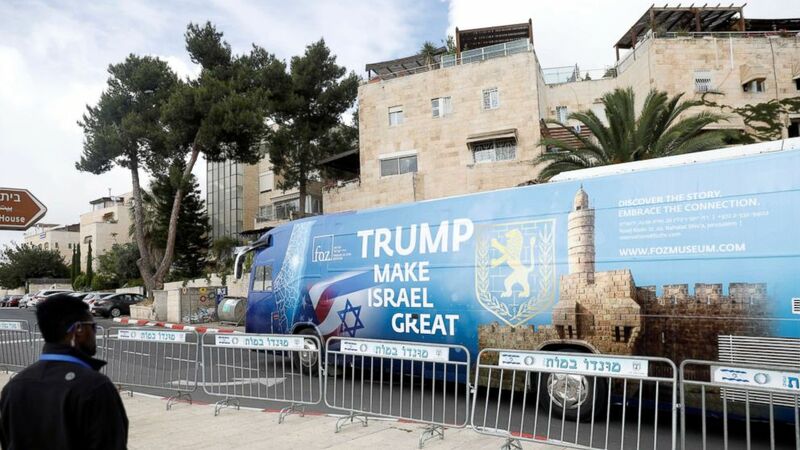 (Ronen Zvulun/Reuters) A bus decorated with Israeli and U.S. flags and a message welcoming the move of the U.S. embassy to Jerusalem is seen near the location of the new U.S. embassy in Jerusalem, May 13, 2018. Einat Wilf, a former Israeli parliament member who supports the two-state solution, told reporters Sunday that for Israelis, the embassy opening doesn't change all that much. 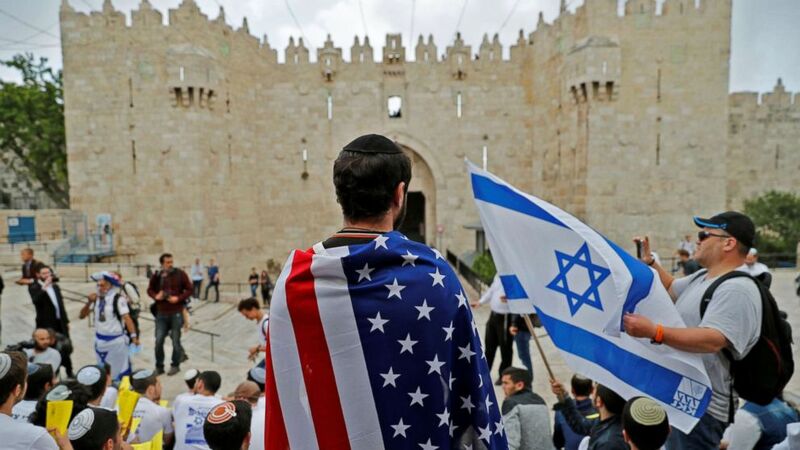 (Ahmad Gharabli/AFP/Getty Images) An Israeli man wears the US national flag at Damascus gate in Jerusalem on May 13, 2018, as Israeli nationalist settlers celebrate the Jerusalem Day in the Old City. "Israelis have been living for 70 years with the knowledge that the western part of the city is their capital," she said. 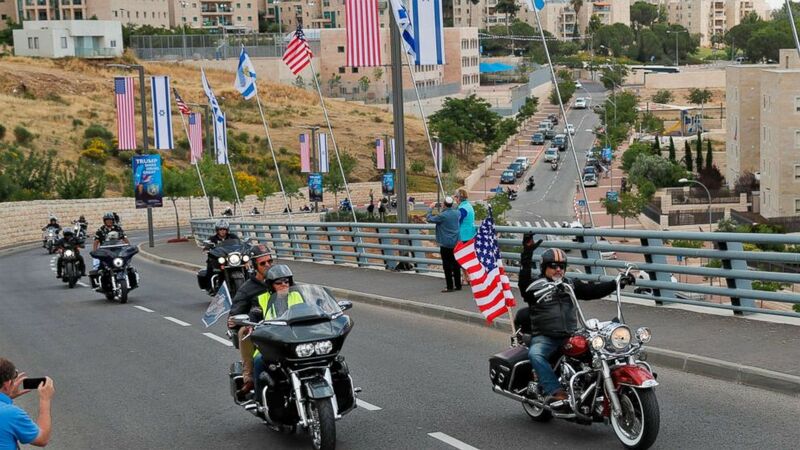 (Ahmad Gharabli/AFP/Getty Images) Israeli motorcycle club, Samson Riders, lead a convoy of Harley Davidson riders in the streets of Jerusalem, May 13, 2018, as they ride from the current location of the American embassy in Tel Aviv towards the new location in Jerusalem. "So, yes, Israelis welcome recognizing reality. ... It's not as if this changes reality, but it is important to have an international acknowledgment." Plus, Israelis were rather busy this weekend with the biggest news in the country: their Eurovision win. And now it's rumored that 25-year-old winner, Netta Barzilai, may just be a guest of honor at today's ceremony. 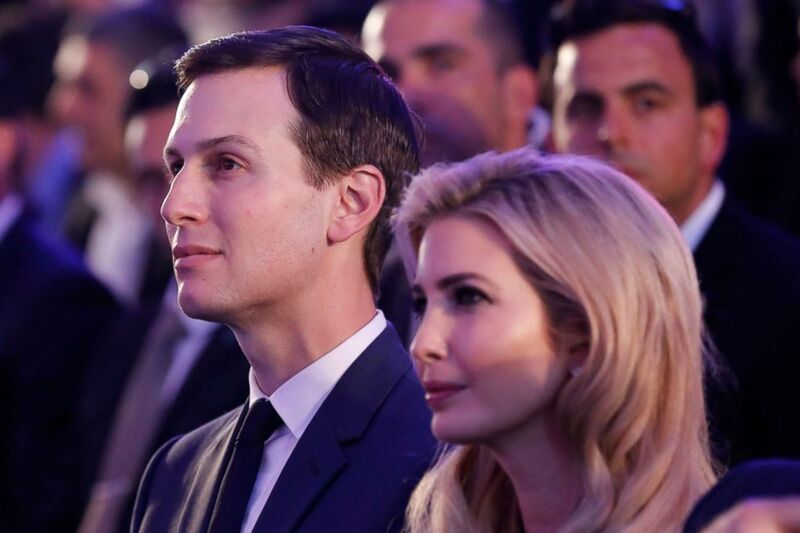 (Abir Sultan/EPA/REX via Shutterstock) Ivanka Trump and Jared Kushner attend a reception ceremony for the US delegation ahead of the move of the US embassy to Jerusalem, May 13, 2018. 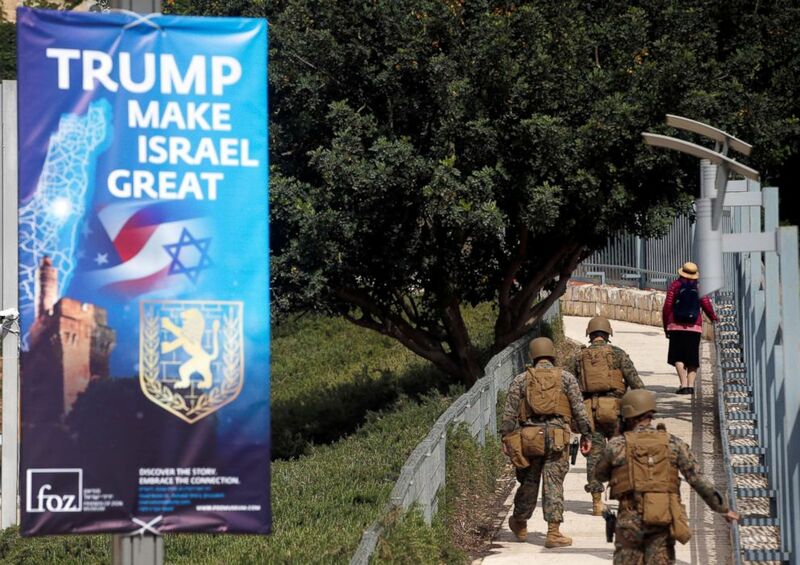 (Ronen Zvulun/Reuters) Military personnel patrol next to a sign welcoming the move of the U.S. embassy to Jerusalem, near the location of the new U.S. embassy in Jerusalem, May 13, 2018. We have a winner! ???????? Congratulations from Israel to ALL talented performers!